Western Sahara is, according to the UN, the last unresolved colonial issue in Africa. 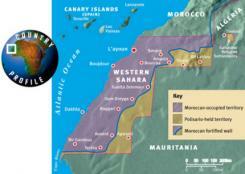 Western Sahara is on the northwest coast of Africa between Morocco and Mauritania, near the Canary Islands. During the colonial occupation of Africa the Spanish colonised the area and it was known as Spanish Sahara. In 1973 the Polisario Front launched a war of liberation. Morocco and Mauritania also laid claim to the country. The International Court of Justice (ICJ) examined the territorial claims of neighbouring countries in 1975. The verdict confirmed that the Saharawi should be allowed to express their right to self-determination through a referendum. Within weeks of the ICJ verdict, Morocco and Mauritania invaded. Much of the local population fled into the desert. Today, thirty-three years later, 165,000 Saharawi still live in refugee camps in a desert area in southwest Algeria, whilst those remaining live in fear under the Moroccan regime. In 1979 Mauritania withdrew its claim to Western Sahara but Morocco swiftly occupied the whole country. Under the leadership of the POLISARIO Front the Saharawi continued their armed struggle for self-determination. The struggle against the well-armed Moroccan forces was long and difficult and the world largely ignored their claim for self-determination during the Cold War. Since 1990 the UN has been striving to implement a peace plan through a UN force, known as MINURSO, and a ceasefire has been in place since 1991. The UN committed considerable resources to resolving the conflict, proposing a free and fair referendum of self-determination known as the Settlement Plan, based on a Spanish census taken in 1974. Unfortunately, continuous delays in the implementation of the Plan, mainly due to Moroccan obstruction and a lack of international political will to pressure for progress, led to an impasse. Former US Secretary of State James Baker was appointed in 1997 as UN Special Envoy to Western Sahara and proposed a referendum on independence but, crucially, participation would not be based on the Spanish census, but rather on residency, allowing many Moroccan settlers to vote and possibly endangering a Saharawi victory and their long-awaited independence. James Baker eventually achieved a reluctant agreement from the Polisario – but Morocco then rejected the deal and the entire idea of an option for ‘independence’. Over the last year there have been a series of face to face talks between Morocco and the POLISARIO Front. These have not made any progress towards the promised referendum; indeed Morocco refuses to discuss any option that includes a possibility of indepence or to include human rights in the discussions. There have been countless well-documented cases of human rights abuses against the Saharawi who still live in Western Sahara but without real international pressure Morocco has consistently refused to reconsider the legitimacy of its claim to Western Sahara.